See also original Reseller A plan location on their website! Prices listed on this page do not include government taxes. 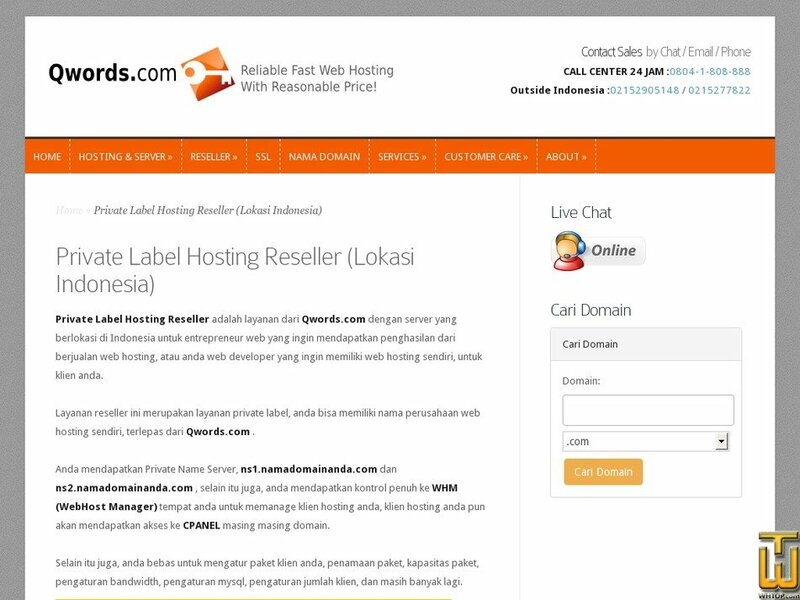 Private Label Reseller Hosting is a service of Qwords.com with servers located in Indonesia for web entrepreneurs who want to earn money from selling web hosting, or you are a web developer who wants to have their own web hosting, for your clients. Reseller service a private label service, you can have the name of the web hosting company itself, regardless of Qwords.com . You get Private Name Servers, ns1.namadomainanda.com and ns2.namadomainanda.com , but it also, you get full control to WHM (WebHost Manager) which you to manage your hosting clients, client hosting you will gain access to cpanel each each domain. In addition, you are free to set your client package, naming the package, the package capacity, bandwidth management, mysql settings, setting the number of clients, and much more.